43% of millennials find that it is easy to set up an account with a fintech mobile app rather than a checking account in a bank. While elder generations more prefer the personal interecation in banks and the non-trust to digital solutions, the millennials prefer not visiting a traditional financial institution as they consider it time consuming and even do not trust the financial institutions after the financial crisis. 15% or so of millennials in US, UK, Honkong, Australia, Singapore and other countries find that FinTech startups have more attractive rates for their services rather than traditional banks. This point especially related to money transfers and loans. Digital money transfer services provide services with up to 0.5% commission fees and do it in much convenient way compared to banks. Also important to mention that loan percentages are much lower in case of consumer end lending startups rather than banks. The main reason for this is that the model is mainly P2P and due to less administrative and consumer acquisition costs these startups tend to have less interest rates which is attractive for millennials. 12–13% of millennials find FinTech solutions more attractive because they think that they can access more services and products “while watching a TV show” or “driving to office” rather than only a specific service for which they should visit a bank. In very many cases these services are powered by AI which uses millions of data sets to help the users make smart decisions while spending very small time. For instance saving or investment mobile apps like Acorns, Robinhood, Qapital or Looma help their users to make data driven smart decisions on saving, spending, investing and thus becoming more attractive for millennials. 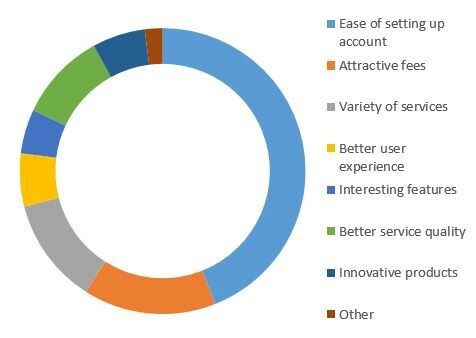 11% of millennials are sure that financial technology innovative solutions provide better online experience and functionality and instead of spending time in a banks website to learn about their services they intuitively get familiar with features of FinTech startups as the user experience is much much better and is focused on getting to results rather than providing tons of unnecessary information. 10% of millennials are sure that traditional banks cannot compete with FinTech solutions in terms of quality and 75–80% of millennials are sure that FinTech solutions have better quality than banks. This is especially very important when we are talking about services such as loans, savings, insurance, investing and other retails banking, personal finance and insurance services. The main emphasis on better quality is that banks cannot provide quick and from A to Z services in a very short time and especially when there is lots of paperwork and bureaucracy which is a nightmare for millennials. 6% of millennials consider the products and services of FinTech startups more innovative compared to financial services provided by traditional financial institutions. Usually financial institutions do not provide new financial solutions too frequently as it takes a whole cycle from marketing and product team to legal and senior management to dive deep into them and made final decisions. Banks or insurance companies usually offer “better bundling” to introduce new financial products, but this is just adding something on top of the existing traditional services and this is for sure not the service that is expected by millennials. They usually want something totally new rather than something on top of existing traditional financial services. While ease of use remains FinTech’s key selling point, it’s a lack of awareness that is the main impediment to its adoption. Traditional financial services firms can learn from how FinTechs think from the customer perspective and how they are using technology to deliver value and convenience and also trust at the same time. The adoption of FinTech products is relatively high for such a new sector, so the risk of disruption is real. Traditional financial institutions need to identify which customers are most at risk from the new competition — and develop new products and services to retain them. This is a must-do first step for traditional financial institutions.